All the talk lately seems to be focused on the Brookhaven RHIC quark-gluon results, which is fine, but not exactly "new", is it? OK then, let's talk a little about the Physics, since yes Virginia, there actually are other fields of study in Physics other than Superstrings, and Jacobson/Verlinde. So, out near the tip of Long Island (New York State) where the wind is so vicious few choose to live there lies a wonderful collider called the RHIC, which basically makes train wrecks out of gold ions and notes the wonderful results. One of these results is a very brief glimpse of what the early Universe may have looked like right after the (alleged) Big Bang, when the babyverse was so hot that atomic nuclei could not form, and the whole babyverse consisted essentially of a quark-gluon plasma exhibiting thick fluidic properties. 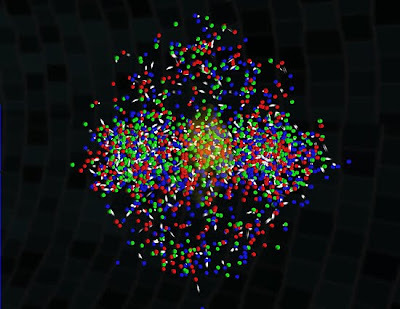 A quark-gluon "soup", if you will. There are several noted websites that go into the details far deeper than here. Plato (the blogger) at his Dialogos of Eide weblog here turned me on to Sean Carroll's explanation of the issue at Cosmic Variance, here, which makes for excellent reading. All talk of "fluids", be they gas, liquid, or plasma, reminds me of my college Fluid Dynamics courses, which then remind me of that LAST unsolved problem in Newtonian (Classical) Physics, which is Navier-Stokes. The Navier–Stokes equations dictate not position but rather velocity. A solution of the Navier–Stokes equations is called a velocity field or flow field, which is a description of the velocity of the fluid at a given point in space and time. Once the velocity field is solved for, other quantities of interest (such as flow rate or drag force) may be found. 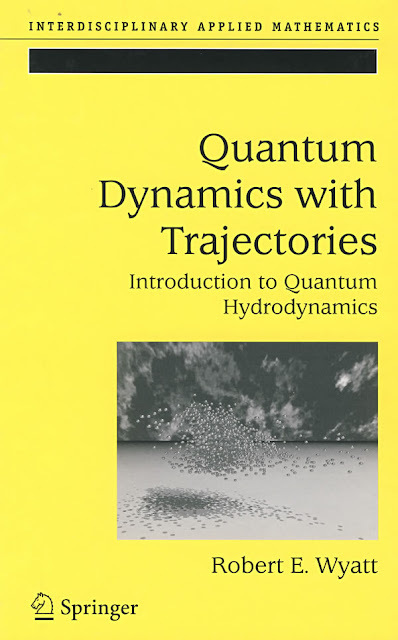 This is different from what one normally sees in classical mechanics, where solutions are typically trajectories of position of a particle or deflection of a continuum. Studying velocity instead of position makes more sense for a fluid, however for visualization purposes one can compute various trajectories. The Navier–Stokes equations are also of great interest in a purely mathematical sense. Somewhat surprisingly, given their wide range of practical uses, mathematicians have not yet proven that in three dimensions solutions always exist (existence), or that if they do exist, then they do not contain any singularity (or infinity or discontinuity) (smoothness). These are called the Navier–Stokes existence and smoothness problems. The Clay Mathematics Institute has called this one of the seven most important open problems in mathematics and has offered a US$1,000,000 prize (approx. €0.68M or £0.62M as of December 2009[update]) for a solution or a counter-example. The Navier–Stokes equations are nonlinear partial differential equations in almost every real situation. In some cases, such as one-dimensional flow and Stokes flow (or creeping flow), the equations can be simplified to linear equations. The nonlinearity makes most problems difficult or impossible to solve and is the main contributor to the turbulence that the equations model. The nonlinearity is due to convective acceleration (due to the change in velocity with position). Hence, any convective flow, whether turbulent or not, will involve nonlinearity, an example of convective but laminar (nonturbulent) flow would be the passage of a viscous fluid (for example, oil) through a small converging nozzle. Such flows, whether exactly solvable or not, can often be thoroughly studied and understood. Bohmian mechanics? WTF? (=Why, that's Funny!). I thought papers on Bohmian mechanics were best suited to line the birdcage with! You mean it's in play again?! Under the heading of Superfluids I can show where I've been and then the rest is up to you. I mean given the environment what features within it would seem apparent to the nature of viscosity to have it perform certain functions that we might loose energy besides all that has been account for in the LHC? I'm drawn to that last one, QHE. It's relatively new, so it's cutting edge and exciting, and has so far received 2 Nobel Prizes in Physics. Superconductivity has won more Nobel Prizes in Physics than any other branch of Physics. Superstrings Theory, by way of comparison, has won exactly zero. Stefan of Backreaction has some more info on this. Use google search function there as one would not like to "search escape:)" but more info to show this correspondence in thinking. Room-temperature superconductivity. It's the holy grail of solid-state physics. A means of conducting electricity without any losses whatsoever at temperatures hundreds of degrees higher than what is required of today's "warm superconductors" - the copper perovskites. So, is this even possible? Can science achieve what seems an unattainably lofty goal? It is in the elements of super fluidity that a correlation has been drawn by me. I gave a link for that. As well, the understanding that when you go back to the very beginning of the universe in terms of measure(not just Steven Weinberg's first three minutes), you have to find places that are represented cosmologically as well. Not just recognize them in your experiments. That correlation has to take place or why do you do experiments? So what feasible means shall you use to go as far back in time that we have just reiterated? What "building blocks" shall you use? Some are afraid of where supersymmetry will take them, as they have to go back to the very measure in the microseconds. Ultimately, where does this exist? 1) Everything "emerges" except the building blocks. 2) ONE building block is unacceptable, because it would not be "acted" upon, so such a Universe would be static, meaning "time" would not emerge. Occam then asks us to look at one number up from "one", that is to say : two building blocks. 3) Each of the then TWO building blocks, based on the simple "law" (if that's what it is) would then NOT be able to be "time-dependent," since "time" will have to emerge from the two building blocks. 4) By process of elimination, all time-dependent "building blocks" will then have to be eliminated. This includes Momentum, momentum-dependent Force, Charge, Spin, and Energy. What is left? 5) Two things are left, as far as I can tell: a specific-quantity Rest Mass, and Geometry. Rest Mass of a specific quantity, and Geometry, with the conundrum that the specific Rest Mass was greater than the specific Geometry can handle. And because the Geometry can't handle it, the Geometry has no choice other than to "expand", and from that, everything emerged. Does that make sense? Maybe not, I can't think of everything. But only ONE theory of Physics (that I have so far explored), as far as I currently understand them, would have no problem with what I just said. It's not a theory I liked when I first heard of it (indeed, it shocked me), but it's also a theory that, try as I might (and I have tried very hard), I can find no fault with. The theory is Fecund Universes, by Lee Smolin. I have since purchased Wyatt's book and am reading and enjoying it. I will add the book to the top of the article now. Lots of good stuff ahead in better understanding electrical current, and tons of other stuff.